OK so on this one let’s start with a little theory! There are two terms used when referring to changing the focal length of the camera during a shot and subsequently what is or is not in focus. These two terms tend to get used interchangeably around the traps but they are actually two different flavors of the same action. The “focus pull” or “pulling focus” is intended to be unseen or unnoticed by the audience. For example we have a character on a street 100 yards away and he is walking towards the camera. As the scene begins the focus is set for that distance but by the time he has walked a few steps towards the camera he is going to go out of focus. So the assistant camera operator has marks both on the ground and on the camera. That lets him know that when the subject hits point A the focus should be set to mark A, then by the time the subject hits point B, the focus should be at the B point mark on the focus dial and so on. Racking focus refers to more static camera shots where you have two subjects in the frame, one foreground and one background. The shots begins with the focus set to one of the subjects and then changes to the other. The purpose of this is to direct the audience attention from one to the other depending on what the video maker has in mind. You will see these used in cheesy soap productions quite a lot! Long suffering person A is in the foreground and equally long suffering person B is in the background. The shot begins with Person B in focus in the background telling person A about some terrible event that has just occurred. As he finishes delivering the awful details the focus suddenly changes to Person A and we get to see his reaction to the terrible news whilst person A has gone out of focus. 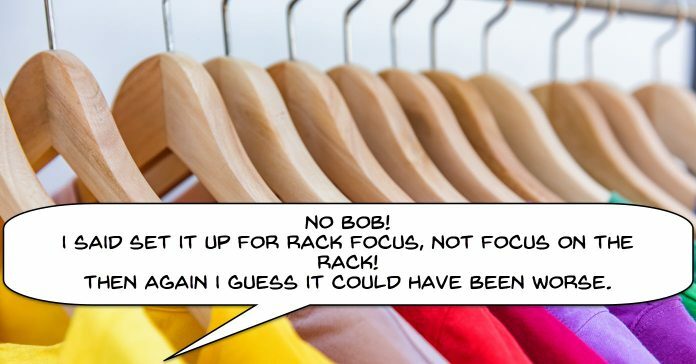 Anyway there are a few ways to achieve a rack focus effect and some of them a surprisingly simple. The original title of the video below referred to Premiere Pro but after having taken a look at the technique described most video editors like Movie Studio, PowerDirector or PinnacleStudio should be fine with it. This a very simple technique using masks, keyframes and moving paths to get the end product. In fact this particular technique is the one many pro editors use to create the illusion of an endless tracking shot that never seems to transition or cut. There is a scene in the movie Birdman, where Michael Keaton’s character gets locked out of a theater and has to walk through Times Square in his underwear to get around to the entrance of the theater. If you just watch that sequence it seems like one very, very long continuous shot. However if you watch it closely there are points within the shot where he or something dark colored totally occupies the screen and it is at those points that the cuts have been made. In this tutorial video the transition is being used to cut from a long wide shot to a medium close up shot of the same subject and from the same camera position. There is no reason to limit yourself to using it in this way. My suggestion would be to get some clips that are conducive to making this transition, play with it until you can do it then go crazy with it! Most of these are relatively advanced tips on getting sharper or more crisp looking videos but worth taking a look at anyway. A 100 Megapixel, Full Frame Sensor that can pump out 6K video aimed at the consumer end of the market… this is getting out of control! Of course this news is actually the result of a leak at Sony so don’t expect to see this next week but it does indicate that Sony really are keeping their foot to the floor when it comes to developing their CMOS sensor. This video is a great little run through on the effect different lighting setups have on faces in video. There will be very few of us that have the time or the lighting equipment to set something up to the degree shown in the video but having an idea of this certainly helps. An awareness that the existing light hitting your subjects in a certain way will create an effect is worth having. Often if you are looking at these things a simple re-positioning of your self as the camera man can make a world of difference to the quality of shots you get. Clearly you and I will not be engaging a qualified art director for our production of this years family Christmas gathering or whatever but the subject of art direction is worth taking a look at. It’s just one of those “little things” that if you at least attend to it minimally will get you better results. Generally speaking video shot on webcams is pretty crappy. The main reason for that is that webcams, in general… are crappy! Far more than your average smart phone video, webcams are beset with a multitude of limitations most of which are there because of their intended use. By far the most important consideration that goes into manufacturing them is that they provide a video stream into a computer that can be easily handled by the computer. Nothing about resolution, the representation of color, low light capabilities or any of that other “video quality” stuff! However in the same way that there are steps we can take to improve phone footage there are steps you can take to improve the quality of your webcam footage. 90 seconds of video with 5 hacks you can use to turn your phone into your light source. My favorite is the phone through the bottle of blue mouthwash trick! If you actually give it time there is some good information in here on getting started with generating income through video outside of the usual “get a YouTube Channel” advice. The guy actually knows his stuff and mercifully as the video goes on he starts to speak more naturally and dials down the fake enthusiasm. If you want to reduce the pain factor then skip ahead to the 2:00 minute mark where the real meat and potatoes begins. There are five video techniques shown in this video clip which is a good thing! On the downside, they are shown in 30 seconds with a (very) brief text blurb on why each one should be used. You may have to replay it a few times but they a very good ideas. This is just a simple video demonstration of transitioning a clip from color to black and white within the PowerDirector interface. This week Filmora announced the launch of Filmstocks Video which is their library of royalty free stock footage. Now of course royalty free does not necessarily mean “free!” I thought I should just add that there. However amongst the clips they do have for sale there are quite a few free ones so its worth wandering over there to take a look. Just as a reminder on this, the Filmora site was launched a while back and was originally a resource for effects and stuff for Filmora users. These days it has expanded to offering video stock, audio (both music and sound effects) as well as still images. To get hold of the free stuff you have to sign up for an account but they are quite well behaved and don’t endlessly spam you with offers.